Is the Death of the PC Around the Corner? I read an article this week discussing the death of the PC and how it’s slowly disappearing from the marketplace. It got me thinking about my latest computer purchase back in 2007. While the PC has been around since the beginning, its presence is beginning to deteriorate, especially with devices like the netbook now on the market, which go for as little as $299 in some cases. Throw in the iPod Touch and iPhone into that mix and there is not much of an incentive to own an actual PC anymore. The last PC I bought was in 2004 — it came with Windows XP Home, which I later upgrade to XP Professional and then Vista Ultimate. I’m still running that machine now, but a motherboard, fan and power supply had to be replaced within the last year. They don’t build them to last, that’s for sure. In 2007 I bought a 20-inch Apple iMac Aluminum for movie editing purposes. It’s turned into my main machine as far as productivity goes, but I still use the PC for e-mail and certain applications that don’t work on OS X. As much as people want to think the PC is dying, it’s simply not — at least not quickly. There is a market demand for these machines, especially in the largely popular gaming community. Walk into any school or university and you’ll see 95% of them running Windows on a PC. So why all the hype about their demise? Not completely sure, perhaps it was the author’s personal opinion who wrote the article I read, but I can certainly see where she was coming from. I was one of those guys who thought I would never own a Mac. The very idea made me cringe and I wasn’t prepared to shift my loyalty from Microsoft to Apple. But something inside me clicked when I visited my first Apple Store in Las Vegas a few years back. The sleek, clean design and fast processor speed made me think I had died and gone to computer heaven. As far as the PC being extinct, I don’t think that will happen anytime soon. 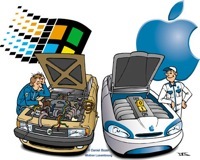 Vista may be extinct, in fact it never really did take off, and Windows 7 will move in shortly and hopefully help Microsoft to gain back their share of the computer market away from Apple. But if you ask me which I prefer over the other; it’s a toss up. I use both and can’t see myself living without either of them. I’ve always used PC. But in the last 3 years I’ve only used notebooks. I’m not a Mac fan but what would happen if I need a PC for any reason? I really don’t what I would do.